This process works on both Prepar3D and FS2004. 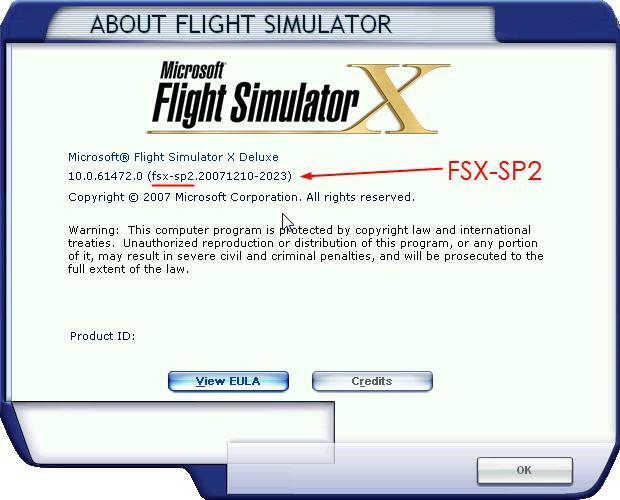 By default, FSX is installed in « C:\Program Files (x86)\Microsoft Games\Microsoft Flight Simulator X ». The problem is that on Windows 7 and 8+ or even Windows 10 you don’t have a full control of the files inside « Microsoft Flight Simulator X », which prevent a program from writing in a configuration file. 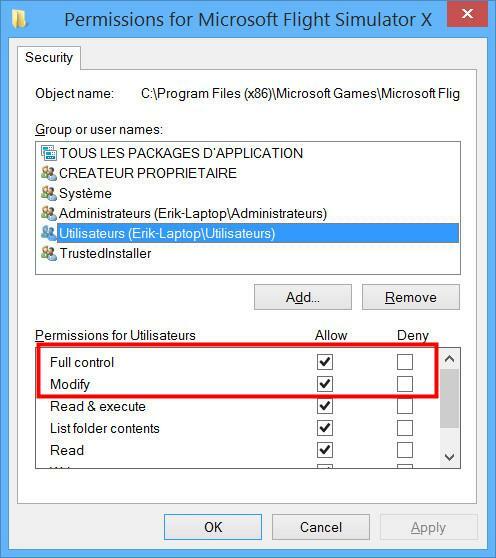 To solve that problem, go to « C:\Program Files (x86)\Microsoft Games », then do a right click on the folder « Microsoft Flight Simulator X », click « Properties », then on the « Security » tab. Here, choose « Users (xxxxxx) », then click on « Modify ». In the window just opened, choose again « Users (xxxxxx) », click on « Full control », then « Modifications ». 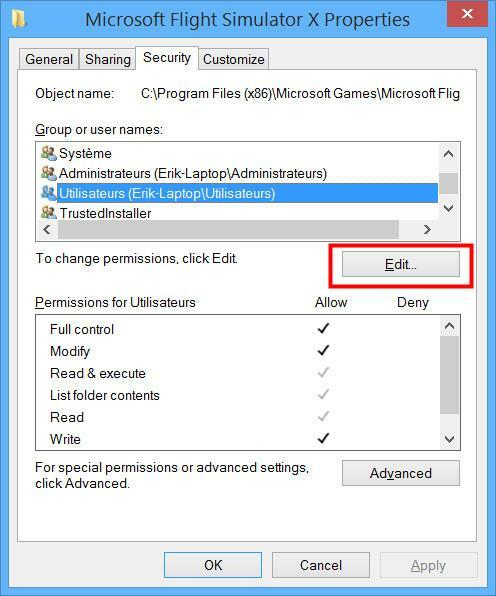 Now, you just have to click on « OK » and Windows will update the permissions. To solve this problem, you have to copy and paste the DLL « msvcr70.dll » in FSX’s main folder (C:\Program Files (x86)\Microsoft Games\Microsoft Flight Simulator X). If you have the same issue on Prepar3D, this solution should also work. Nevertheless, we have not tried it on P3D. Something essential, when you own an add-on which 3D model was created for FS2004 but used in FSX SP2 (also called Port Over), is to deactivate the Preview DirectX 10 in the settings of FSX. In fact, FS2004 addons aren’t compatible with DirectX 10. Example 1: A part of the airplane is invisible. Example 2 : The wings if the airplane are invisible. Example 3 : The airplane is entirely grey, without texture. The solution : Deactivate DirectX 10 preview. Step 2 : Unpack the ZIP file and place the extracted UIAutomationCore.dll in the root of your FSX installation folder where the file fsx.exe resides. Make sure FSX is not running. 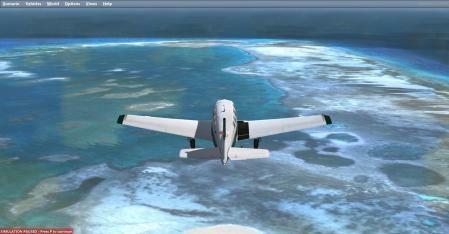 After this action, start FSX and you will find that switching views in FSX, no longer eventually causes FSX to crash. Without this fix, FSX will hang as well as you will be “timed out” in a multi player session. Do not use any other versions of UIAutomationCore.dll, since this version is the only version that will stop the crashes. 1- Install FSX normally with the DVDs. 3- Download the 32 bits version of « UIAutomationCore », unzip the file and paste it in FSX’s main folder (C:\Program Files (x86)\Microsoft Games\Microsoft Flight Simulator X\). 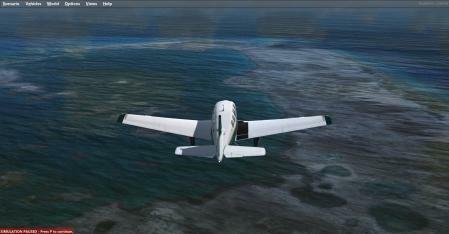 It will correct the problem of unexpected crashes of FSX. SP stands for Service Pack 1 or 2, which are patches improving FSX. They are available after the game’s release. You have to install the Service Pack 1 (SP1), before the second one. 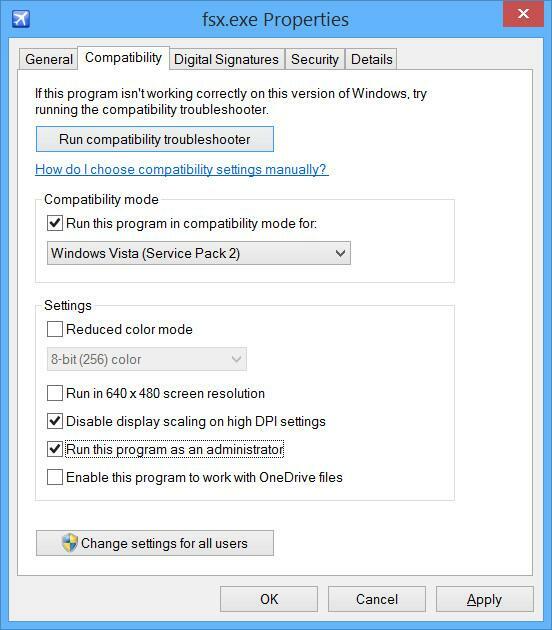 This works on Windows Vista, 7, 8 and 10.
have to choose the one you want to uninstall. Other method, from the Control Panel of Windows choose Programs and Features now you see the list of all your installed programs, select the one you want to uninstall. From auto-installers version 10 or + all documentations are located in My Documents folder or Documents based on your Windows version. On the desktop, click on the « Start Menu », then on « All Programs » and go to the « Rikoooo Add-ons » folder. When you click on it, you’ll find the list of add-ons you’ve installed on your computer. 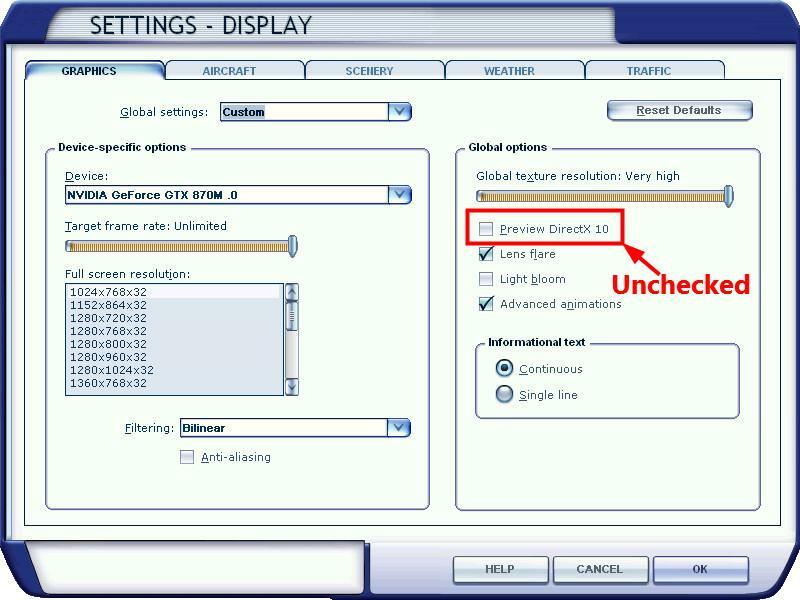 First, check that you have FSX-SP2 installed on your computer. Indeed, the « Preview DirectX 10 » only appears if you have installed the SP2 patch or if you have FSX Acceleration or FSX Gold or FSX Steam Edition. When a lot of modifications have been made into the « Gauge » folder, it is frequent that a part of the base files are missing. In that case, if an add-on needs theses files, it won’t be able to display the gauges into the panel. Often solution consists in reinstalling FSX. In order to avoid reinstalling FSX, you can download Gauge Recover, which is a little program created by Rikoooo that will restore every original file from « Gauges » and « Effects » folders. Update 13/02/2014 : A Prepar3d version is being created. This problem is caused by the activation of the function Hardware Tessellation in the graphic configuration of Prepar3D v2 or v3. 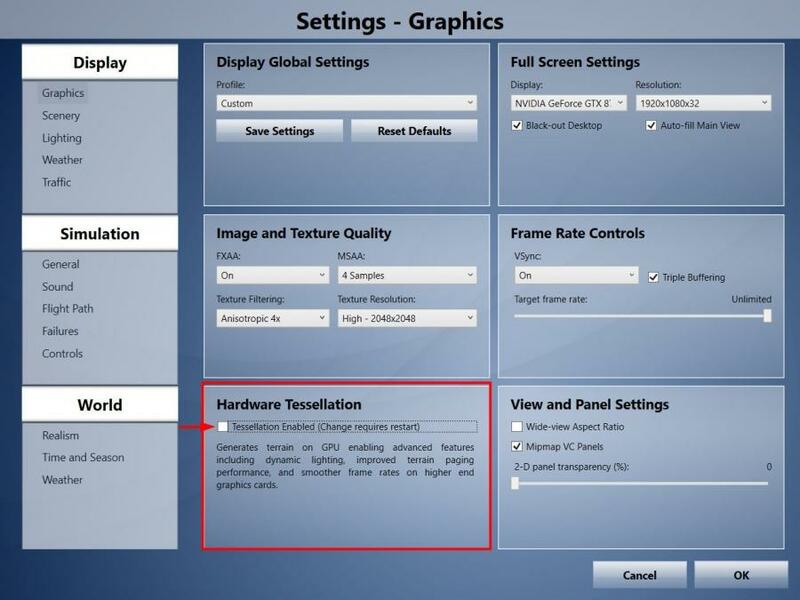 As shown in the above comparison, disabling the function Hardware Tessellation fix the problem. After deactivation you must restart Prepar3D for the fix to take effect. 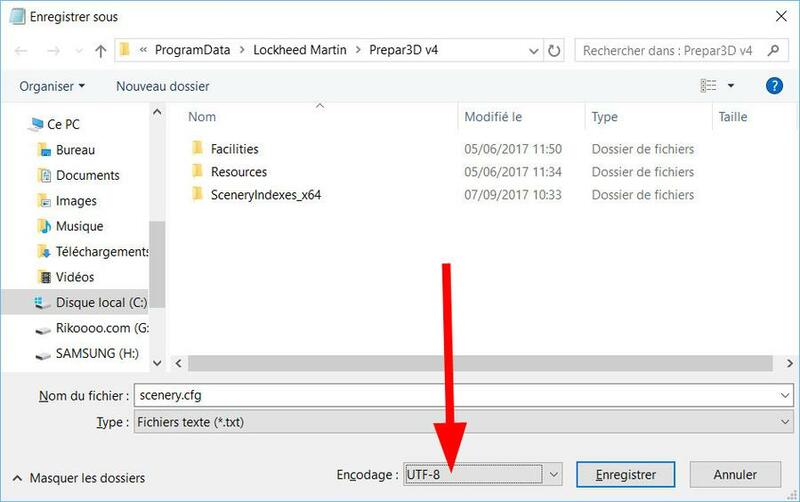 Users of new Prepar3D v4 : Following a charset change in Scenery.cfg to UTF-16LE the auto-installers can not anymore enable your scenery automatically. Temporary solution : Open the folder C: \ ProgramData \ Lockheed Martin \ Prepar3D v4 then open the file Scenery.cfg with Notepad then click File - Save As ... In the window that opens select UTF-8 in the Encoding field (see image below) and click Save. Re-install the scenery and voila. 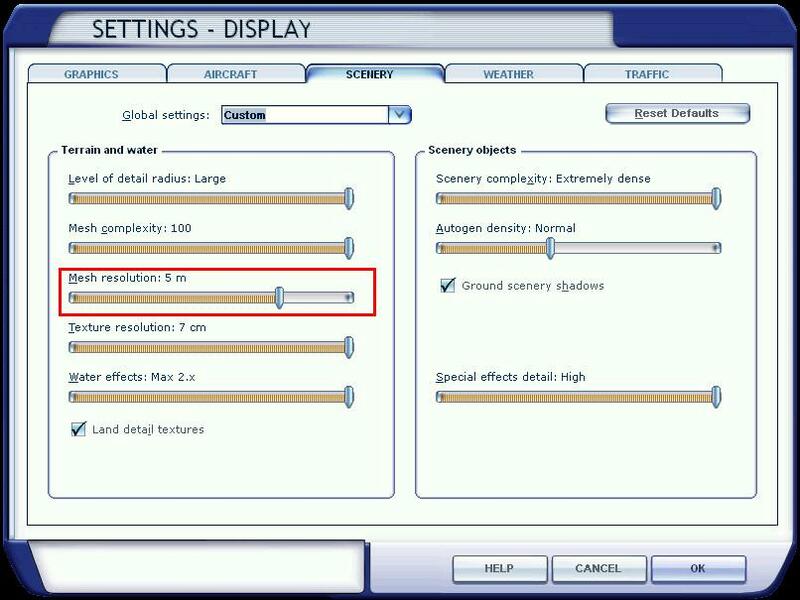 This fix must be repeated for each scenery installation because P3D re-save the Scenery.cfg file in UTF-16LE after each opening. Sceneries added after September 6, 2017 are not affected by this issue. We are updating the automatic installer of each scenery, the problem will be corrected soon, but takes some time. You wait but nothing happens, no file is downloaded, possibly after a few minutes of waiting you receive an error message of the type "Connection timeout" or "ERR_EMPTY_RESPONSE" or other messages according to your Internet browser. In fact, the downloads from Rikoooo are sent from another local server on port 8888 (ex http://download.rikoooo.com:8888) this for a better stability of downloads especially with files of several Gigabytes. The problem is that the firewall of the router (ex Livebox, Freebox, Neufbox) of certain users is configured to refuse the port 8888 (and also the port 8080), to know if you are in this case, go to Simviation.com and download any file at random, if the download does not start (like at Rikoooo), then you are among those small percentage of users whose router blocks port 8888 (and 8080 for Simviation). Those ports are normally used for the web interface, streaming, and HTTP, therefore, it's safe to open. You must connect to your router (ex Livebox) and add a rule that opens the 8888 TCP / UDP port. Here are links to some articles in English that explain how to open your ports, do not hesitate to do your own research on Google using the name of your Internet service provider as a keyword. 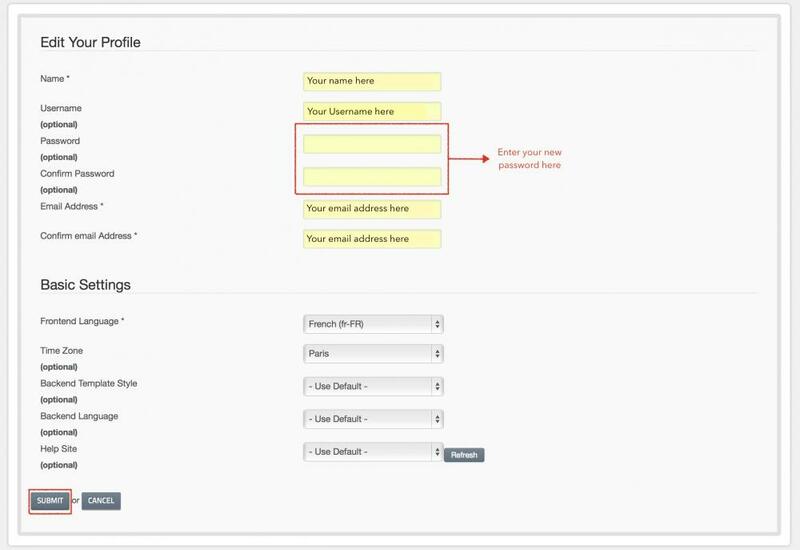 The first thing to do is to log in to your account using the connexion module to the top. Click on « Edit my account ». Now, you just have to enter your new password twice, in the fields shown below. Then, click on « Submit » to save the modifications. If you still can’t access your account, contact us so that we can make the necessary modifications : Contact us. If you see « - Statut : No Jumbo », that means your Jumbo subscription isn’t activated. Try to reconnect to your account, using the « Log out » button. It should activate your Jumbo subscription. - If you see statut « Jumbo OK », but your download speed isn’t higher than 220ko/s, then check that your bandwidth isn’t slowed by other programs trying to download in the same time. - After activation of your Jumbo please make sure to restart your downloads already in progress, Jumbo URLs will change. - You should also check that your Internet connexion allows you to do high-speed downloads. It can be necessary to do a test with another computer and another Internet connexion to check that the problem does not come from your computer.